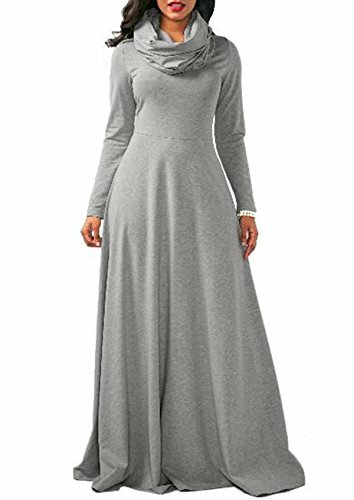 ASSKDAN Womens Casual Long Sleeve Turtleneck Full Length Maxi Dress Plain Loose A-line Party Evening Plus Size Long Dress (Gray, XXL). Hello!!! Nice To Meet You,Please Feel Free To Choose Our Products,You Are Worth Buying Our Products,We Have A Perfect After-Sales Service,We Will Not Let You Down. 1. If you have any problems with our items or services, please feel free to contact us first. 2. A Friendly Customer Service — Our friendly customer service is at your disposal to ensure your full satisfaction and a superior,engaging online shopping experience. You deserve the best..
Comfy,Soft And Stretchy,High Quality Material and Unique Design, Makes You Stylish And Fashion. Style: Casual, Fashion,Turtleneck, Long Sleeve, Loose Fit,Pure Color. Perfect For Evening Party, Cocktail, Vacation Or Daily Wear. If you are not suitable with the size you purchased from our company, or any problems after receiving the goods, please feel free to contact us.We have a good after-sales service team, we will actively deal with your after-sales issues.